midge, appearing on the colors, quite often bothered growers. The people they are also called fruit midge. Sometimes, to get rid of lice is quite difficult. These are small insects, black body having a length 3-4 mm. Their main feature is the increase in activity during the soil moisture in a flower pot: during a simple irrigation or spraying lice begin to swarm around the plant cloud. Normally mosquitoes infest fruit due to excessive irrigation and, Consequently, stagnant moisture in the soil of indoor plants. But they can appear in the house with the land purchased poor quality. Adult midge damage the plant will not cause, but the larvae, they lay, are certain dangers, after all They feed on plant tissue, including. and healthy roots. first, what should be done, is to be done watering the flowers less abundant. Very useful to uniformly supply water to plants, pouring it into the pan. This will prevent the accumulation of moisture on the soil surface, but, so, favorable conditions for the emergence of new lice will not be. periodic loosening the soil will not be superfluous, but in some cases, to save the plant and get rid of lice, You need to replace the whole earth com. In order to bring the already emerging pests and destroy their larvae, folk methods can be combined with chemicals. for example, ordinary sticky tape for catching flies It helps to fight and flying fruit midge. If after a week, they have not disappeared completely, so, larvae delayed more, izlavlivaetsya than adults. In this case, additional measures are needed. Conventional activated charcoal We need to grind into a powder and sprinkled topsoil. During 5-6 days midges must drop altogether. It is not recommended to resort to watering plants with a weak solution of potassium permanganate, As the Council some sources, tk. You can burn plant roots. You can grind to a pulp a few cloves of garlic and the resulting mass is put a thin layer on the surface of the earth in the pot, replace it by 2-3 day at the latest. The procedure is repeated for 10 days. 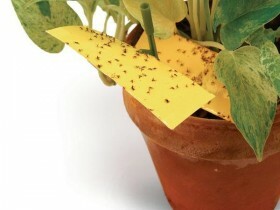 This method is simple and effective pest control. An excellent tool in the fight against lice is wood ash. Besides, it is also an excellent fertilizer. Often referred to on the Internet the way, involving the use of sulfur from matches, It will not help to get rid of lice, he is completely ineffective. As a last resort, you can resort to drugs from the group of insecticides. It is important to observe the correct proportions in the preparation of the solution, tk. active ingredients at doses of non-compliance can be dangerous not only for plants, but for a man. The most effective in the fight against lice medications are "Akhtar", Bazudin ' (or its equivalent, "Trap"), Muxoed ', "Thunder 2". These drugs are toxic and are suitable for use in the home. 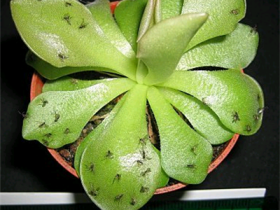 To avoid black flies and other pests, need to carry out watering plants only, when it is required and in moderation. It is not necessary to be zealous with organic fertilizers, particularly desirable tea leaves. loosening the soil, and the timely removal of the decomposing parts of the plant will help to preserve the health and beauty of indoor plants for a long time.